Leviticus 25:10 And you shall consecrate the fiftieth year, and proclaim liberty throughout the land to all its inhabitants. It shall be a jubilee for you, when each of you shall return to his property and each of you shall return to his clan. I don't suppose there is an area or areas of your life where the enemy has stolen from you? Have you had setbacks in your health, your finances or your relationships. Maybe even your purpose & destiny have been sideswiped or derailed? Have there been promises the Lord has put in your spirit that haven't come to pass? 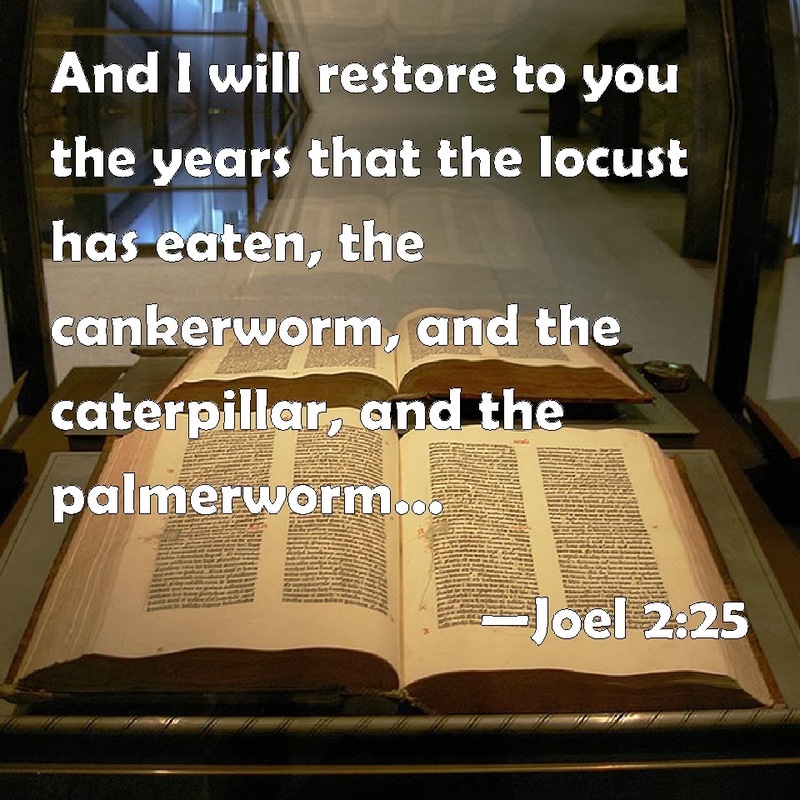 What if this season, this year the Lord wants to restore those things and bring those promises in to fulfillment? What is your role in bringing these things to pass? those whose hearts are fully committed to Him. Several years ago, I blogged on this verse. The Lord was speaking to me that we (many in the Body of Christ) was coming into or was already in a season where He would be strengthening us. How does He strengthen us? Through exercise and teaching in the fruits of the Holy Spirit, through intense perseverance, through hard deep heart work, through renewing our minds and stripping things away from us so all we have is Him. He strengthened some us by allowing us to become dependent ONLY on Him....for provision - no income or limited income, for health - changing our eating habits and trusting Him for medical care. He allowed people and relationships to be removed from our lives. Even some of our callings seemed to have gone into idle mode. If you are one of these people, there is hope and there is a real shift beginning. It is faith (confident trust in God) that will bring you into these things. It will require swift and immediate obedience. It will require ongoing, continued perseverance and pushing through with prayer and time in the Word. Winston Churchill says "Never, never, never give up". Whew that's a hard one sometimes! The Lord gave me a vision recently - I saw a cloud initially over El Dorado Springs, MO where we have moved....and then it expanded over America and then over the entire world. I saw it "reigning" glory down. I heard a saying I love: "When God reigns, it pours." I saw God's glory falling from this cloud, covering all of those whose hearts have been steadfast and committed to Him, loving Him fully despite all they've been through. I saw land, homes and buildings being given, and supernatural debt cancellation to many people so they can walk into their calling and purpose. 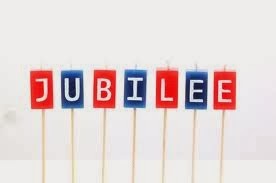 Jubilee! I saw broken relationships that have been bad or over for so long, be completely resurrected and restored even better than it was. Jubilee! I saw people getting out of wheelchairs, dancing and leaping, miraculous healings in hospitals and doctor's office waiting rooms empty. Jubilee! I saw people who have been living with little to no finances see their bank statement balances increase supernaturally. Jubilee! And with the year 2014 - 7 means fulfillment, completion....2 x 7 = 14 double measure of spiritual perfection!! Update on Us! - We have been in our new place since 2/2. The movers came 2/3 just in time before the big snow storm on 2/3 (we only got 4" or so). We are unpacked as much as I think we will be. We have 2 rooms and 1/2 a garage stacked floor to ceiling, wall to wall. The first week was pretty intense warfare - comes with new territory. Many from our new church came over BEFORE we got here and did a major cleaning of the house - omg what a blessing that was. There is still much to be done but little by little we are working on it. We are already getting plugged into a citywide prayer meeting - different denominations, mid week church meeting, end of week praise & adoration. All are kind and welcoming. The pace is much slower!!!!!! Where are my books?? We don't have good internet at the house, so currently using McDonalds free wi-fi! Texting is best, calls often go directly to voicemail so leave a message or I won't know you called. Feel free to email as well, just can't always respond timely. Please continue to pray for God's provision, healing - I'm back to daily migraines, lots of pain, fatigue and no sleep, peace and next steps for us as we are pressing in for God's will and plan for us here. Our lease is up 7/31... and though it's only February....there are no other homes to rent here. Our landlord has a buyer waiting for lease to end.... We feel God has a house for us here so we really need to have God show up and show off again. We are standing on the promises.... please stand with us! Thank YOU to those who have been checking in on me. I can't tell you how much that means to me - though we are meeting new people, we feel a bit disconnected and out of sorts (Not in a bad way). Our LLC is official - Want InSight Chaplain Services. We still have many things that need to be done, logo design, website, etc.... waiting on God to provide the resources and further direction. Adventures - Update on move to Eldo!